Thermoregulatory huddling behaviours dominate the early experiences of developing rodents, and constrain the patterns of sensory and motor input that drive neural plasticity. Huddling is a complex emergent group behaviour, thought to provide an early template for the development of adult social systems, and to constrain natural selection on metabolic physiology. However, huddling behaviours are governed by simple rules of interaction between individuals, which can be described in terms of the thermodynamics of heat exchange, and can be easily controlled by manipulation of the environment temperature. Thermoregulatory huddling thus provides an opportunity to investigate the effects of early experience on brain development in a social, developmental, and evolutionary context, through controlled experimentation. This paper demonstrates that thermoregulatory huddling behaviours can self-organise in a simulation of rodent littermates modelled as soft-deformable bodies that exchange heat during contact. 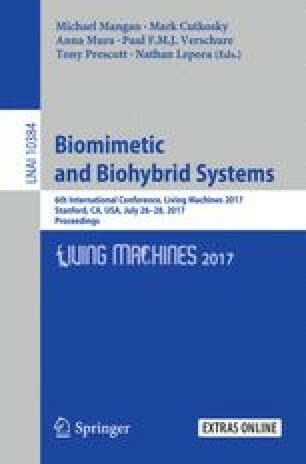 The paper presents a novel methodology, based on techniques in computer animation, for simulating the early sensory and motor experiences of the developing rodent.